If you’re on the run with your RV, seating and sleeping become very important factors to consider. A stylish and warm RV sleeper sofa is your best bet. They’re soft, robust, pretty, multi-functional, and best of all – enough comfortable to ensure your passengers have a great experience from start to finish. So it’s time to hit the road and pull out your RV sofa bed for you or your guests. And if you don’t have a sofa bed inside, this RV sofa sleeper buyers guide will help you choose the right one. Believe it or not, there is a variety of RV sleeper sofa bed styles to choose from. An RV sleeper sofa is a pretty cool piece of furniture because of the way it can be used both as a couch and as a bed. We discover both pros and cons that we’ll share with you. Savvy shopping is not about grabbing a sofa sleeper at a reasonable price – the actual savvy shopping is to find that the sofa bed is value for money by serving you perfectly. Everyone is going to have a different opinion about, but most will agree that a sleeper sofa can be a pretty and very useful addition to your RV. If you decide to buy a click clack sofa bed to serve your RV, you will get something really comfortable that can act as a couch or a nice bed. A major benefit to click-clack sofa beds is that it is self-contained; it does not need a separate mattress or slipcover. All you need to do is convert it to a bed and go to sleep. Even they are great in design and style, Chesterfield sofas or Camelback sofas does not suit an RV decor. Despite their name, RV sleeper sofas or RV sofa beds don’t have any difference with standard sofa sleepers. In fact, they have the same features to bring you the ultimate comfort. The only difference is they are more compact and helps to save RV space. Due to this feature, it’s possible to manage available space more efficiently. However, this doesn’t mean you cannot buy a regular sleeper sofa (as the ones we recommend below) as long it will fit your RV space. These comprehensive reviews look at Top 10 RV sleeper sofas, recliners and wall huggers available online. If you don’t want to get the wrong product, our list is right for you – so you can hit the road in style and comfort! 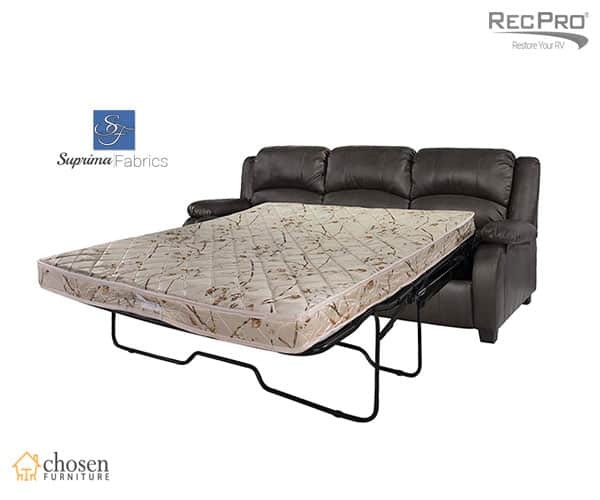 This RecPro Charles 80" RV Sleeper Sofa with Hide A Bed easily pulls out to make a comfortable bed. It has a modern design with superior comfort, including padded armrest, headrest, and seat cushion. The all-metal bed frame can be easily pulled out using a convenient handle. The mattress which is included has 5 inches thick. The faux leather (polyurethane) material is strong and easy to clean. This RV hide a bed will look great in any RV, trailer, camper or apartment. 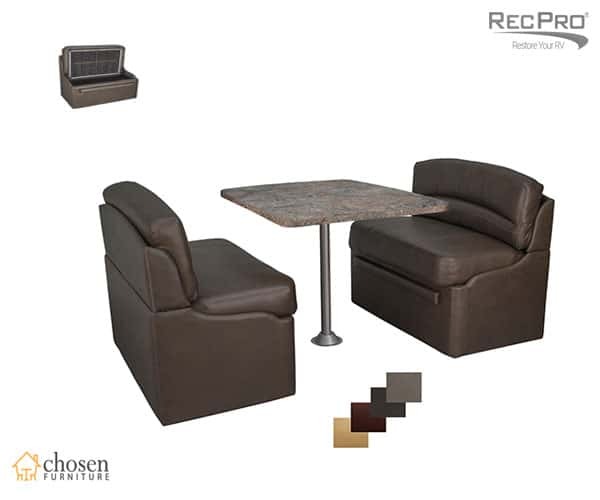 The scaled pattern of the polyurethane fabric gives all of the RecPro furniture an elegant look and feel that will match well with any decor. 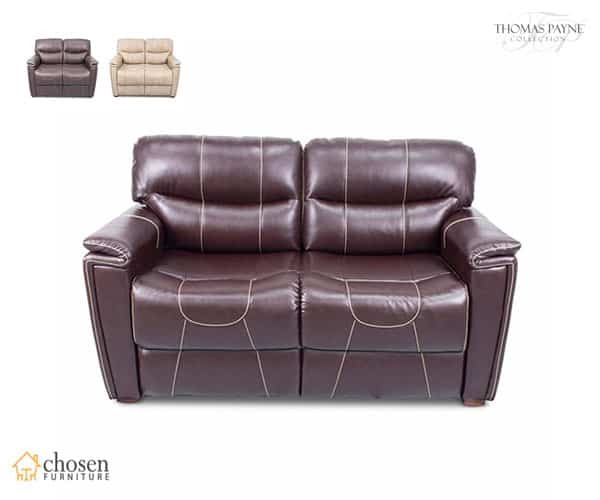 Known for its versatile functionality and comfortable sleep surface, the Thomas Payne 380400 Jaleco Chocolate 68" Trifold RV Sleeper Sofa converts to sleep surface in four simple steps. Thomas Payne’s Tri-Fold sofa sleep surface is constructed of supportive high-density foam, with no support bars that poke through to disrupt your sleep. You will enjoy the comfort of this tri-fold RV sofa, but you will also love the style and elegance the rich PolyHyde upholstery and modern contrasting stitching brings to your RV. It is also low maintenance and easy to clean, perfect for those traveling with pets and kids. 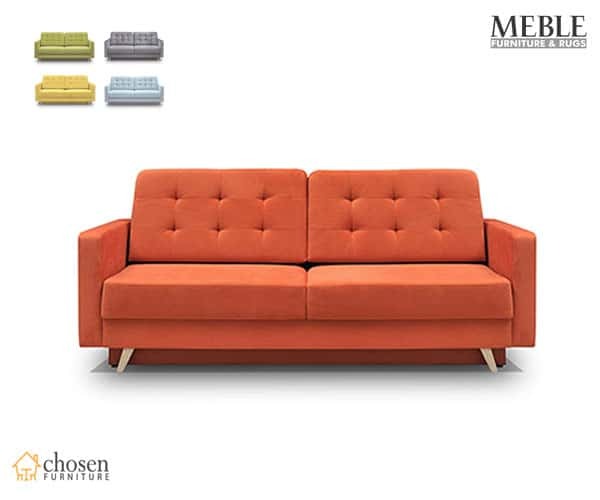 This modern sofa has enough classic elements to blend with your existing RV style. 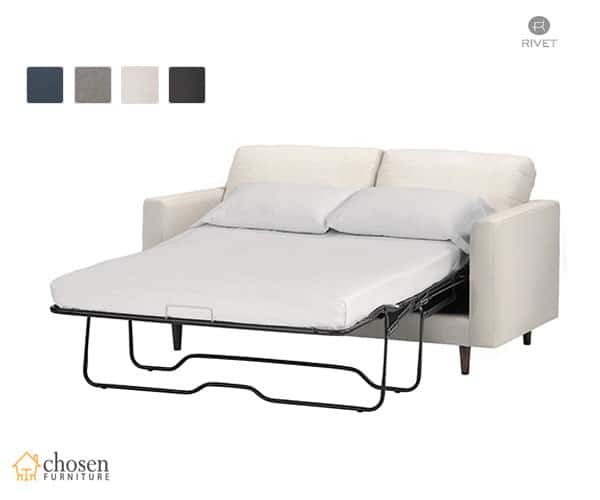 Clean lines, comfortable seating and durable fabric give to Rivet Revolve Modern Sofa Bed and RV Sleeper Sofa functionality as well as smart design. The sofa goes well in an RV, but also works well with a living room decor. The assembly is an instant snap, the weave on the fabric feels soft to the ski, and the construction is very, very sturdy. The cushions are squishy, but it’s not overly soft that you couldn’t get up from it. For the price, you couldn’t have asked for anything better. It is quality made and has a high-end look. When you hit the road and you’re riding cross-country, you need furniture which has durability, beautiful aesthetic, and design. 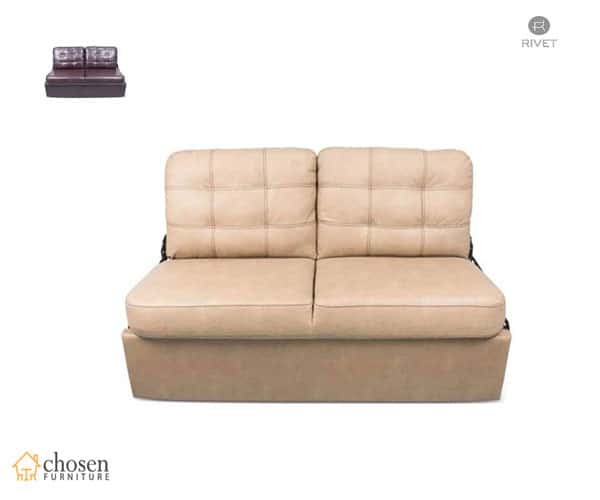 And these elements sets the RecPro Charles 67" Double RV Wall Hugger Recliner Sofa with Console apart. What better way to relax and watch TV than with this theater-style seat that easily fits two and has a center console with chrome cup holders that can store your favorite beverage? There’s also a generous storage area in the center console to allow snack storage. This space-saving double recliner only needs 3 inches of clearance. 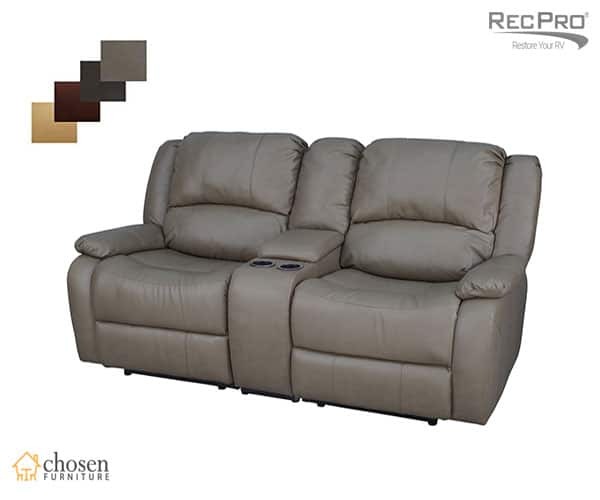 Interiors furniture design blends attractive appearance and comfort plus state-of-the-art manufacturing processes to bring you the Jack Knife RV Sleeper Sofa Beckham Tan With Kickboard. 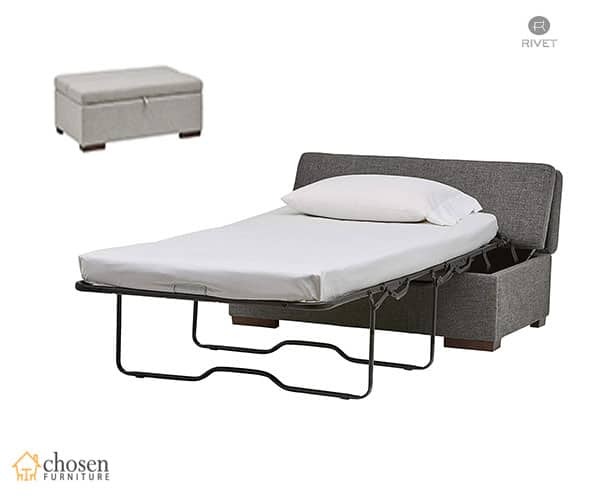 With one easy motion, this steel-framed RV sofa converts to a complete bed. High-density foam and steel spring seating support promote comfortable and restful sleep. The intelligent design allows additional storage space underneath. The rich upholstery and contrasting stitching are not only beautiful but make it also easy to clean and maintain. Perfect for those traveling with kids or pets. Fookoo FHD4-Wired is a modern backup camera system that has just been launched on the market. It’s the first company to introduce 1080P technology for backup cameras, the digital high-definition image processor will make you’re reversing more confident and safe. The 2 million pixel camera is IP69 waterproof with 18 infrared lights and 100 percent did not wash out sharp CCD sensor and night vision. The monitor is the largest and brightest monitor available for backup cameras, while the camera is the sharpest there is. auto dimming feature automatically dims the display brightness based on ambient light. this means a super bright display during the day and a dimmer one at night. 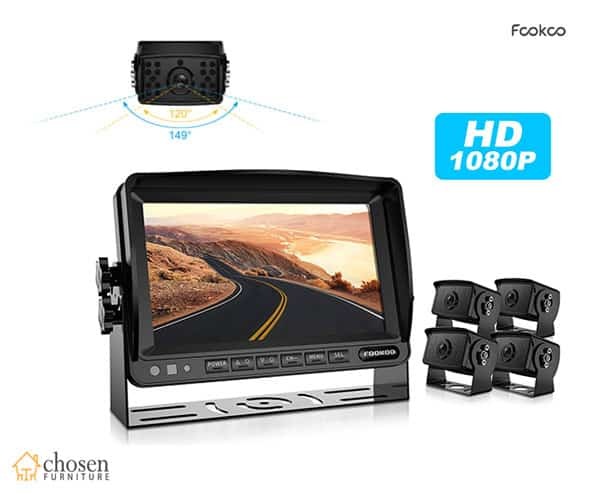 If you want a modern backup camera system that offers recording clarity that is out of this world, then Fookoo FHD4-Wired is just right for you. If you are looking for a reliable product that works in any type of weather and is equipped with multiple features, then you should try this system! Discover the magic of modern furniture – an ottoman by day, a bed by night. This handy piece of furniture provides a footrest and extra seating in your RV, then folds out into a twin-size bed perfect for hosting guests. Rivet Fold Modern Ottoman RV Sofa Bed features a manufactured wood frame and polyester upholstery. Its fold-out bed includes a 2.5 inches foam mattress. Very durable frame with metal-to-metal connections for strength and durability that will handle up to 250 lbs. It looks like a piece you would already have in your RV or living room, and no one would ever know it doubles as a bed. Not to mention, it provides extra seating or a place to prop your legs, which is always appreciated in smaller spaces. Of course, RecPro Charles 44" RV Dinette Booth with Storage and Memory Foam are not sleeper sofas, but we thought you might like them. It will save you a lot of RV space and the booth set (includes 2 ea. Charles Dinette Booths) is a step up in the aftermarket line of RV furniture products. Extremely soft cushioning and soft Suprima Poly-leather are great, plus, it features bench-wide storage underneath. These RV dinette booths can be purchased singularly or in a set. Combined with strong table tops, turn into a soft and sturdy bed that offers all of the comforts of a friendly bed. This kit will add a touch of class, comfort, and functionality to your RV. 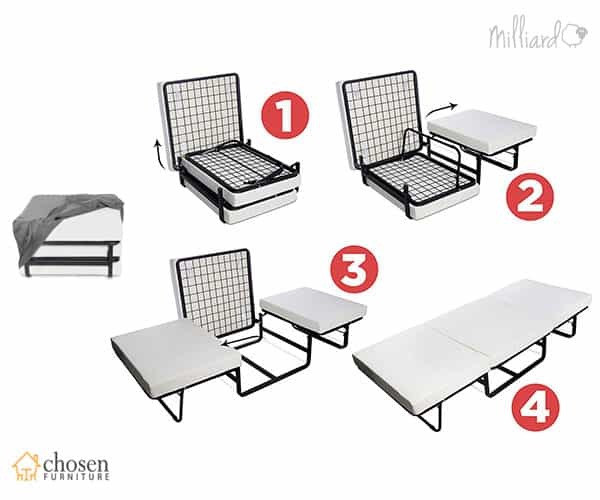 Designed to be used while being stored, the Milliard RV Folding Bed Ottoman Single Size is never in the way. The grey, suede-look cover compliments almost any decor so you can keep it anywhere in your RV. Constructed of high-quality materials, beginning with a durable frame made of steel tubing that lasts. The unique wire-latticed platform has minimal flex to keep your back well supported and eliminate that sinking feeling. The mattress is made of CertiPUR-US certified foam with an IFD of 32 for longevity, and each section is encased in a washable and removable zippered cover. The entire construction is overbuilt and counter-weighted to support a 200 lbs weight capacity and a much longer service life than comparable models. Maximize your RV space with the innovative RB Components Folding RV Sleeper Sofa. These folding sofas are completely assembled and manufactured with the finest materials. Standard materials include durable charcoal grey olefin upholstery covers and a black powder-coated steel frame. 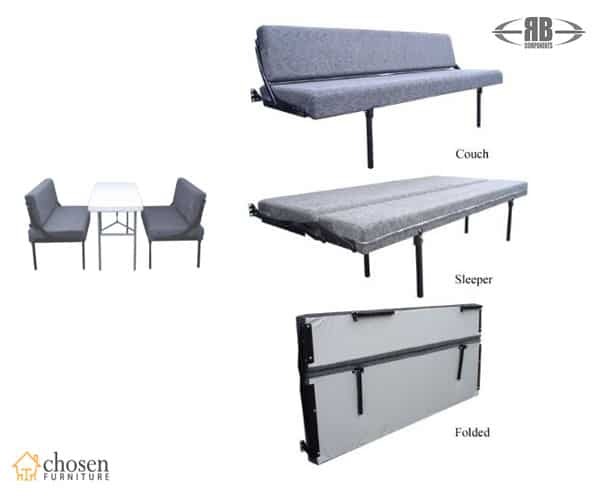 Due to the unique mounting pattern of this folding RV sleeper sofa, RB Components Bed Support Brackets are highly recommended to make installation more simple. When folded into the sofa configuration, the front seat edge is 29-inches from the wall and the bottom of the seat frame is approximately 14-inches off the floor. When unfolded into a bed, the unit measures 43-inches from the wall. Once folded up flat against the wall, the unit measures 7-and-1/4-inches from the wall to the farthest point and the top of the unit measures approximately 52-and-1/4-inches high off the floor. Saving RV space never goes out of style. The Vegas Futon RV Sleeper Sofa Bed Queen Size is a high-quality product manufactured and imported from the European Union. Comfortably seats 3 people, perfect for small RV spaces, looks nice also on apartments, homes, bedrooms, and living rooms. It’s a versatile RV sofa sleeper bed with easy to open Queen sized bed. Make the most of your square footage with this RV sleeper sofa, a convertible design that lets you transform RV into a guest room at a moment’s notice. Upholstery color upholstery brightens up any RV while sturdy wood legs add a sophisticated finish. The soft cushions make a perfect place to lounge alone. 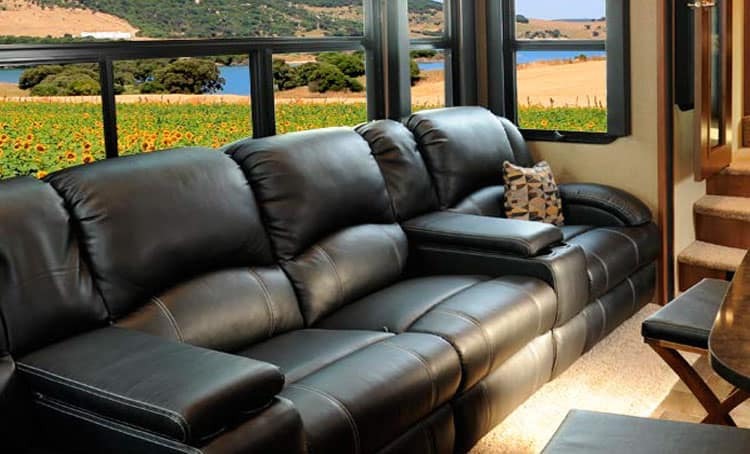 There are different sleeper sofas for RV’s to choose from. Fortunately, the list of ones that are truly exceptional and worth buying is not so big. Before you buy it, determine the actual dimensions of each sofa, measure the inside of your RV, and visualize where each sofa sleeper bed will be placed to get a feel for whether or not it is the right look or style. Since the size is a matter, besides dedicated RV sofas, consider taking a look at regular Queen sleeper sofa beds or a twin size sleeper sofa. If you can do it, consult with those around you to narrow it down to the best options for your RV. It is important that enough research is done before every purchase. Comfort is a huge part of your RV, so make sure you choose wisely! Dan S. Morris, an engineer, online entrepreneur and owner of ChosenFurniture website. Dan and his team are dedicated to serving you with savvy client-focused information and state-of-the-art furniture reviews, uncompromising integrity as the hallmarks of his service. If you live in tiny houses, apartments, dens, or RV’s, a twin size sleeper sofa will get higher importance regarding space-saving needs. It’s a welcome addition to any home – they come in different styles, sizes, and types of upholstery to fit well with your style and decor. With that in mind, we have compiled a list of 10 of the latest models that hit the market. Once you’ve considered our tips, shop online to order the perfect match for your home. Purchasing the perfect queen sleeper sofa can take patience and time to dig for a lot of information. All these sleeper sofa beds have different styles, sizes, and vary in prices. Check if it’s soft, has a sturdy frame and top fabric, with excellent mechanical parts. Find a model that’s easy to care so you can spend time on more important things. When used as a bed, pair with pillows for a clean, modern look. People are looking for the best types of furniture that will allow them to make the most of their compact space without compromising on design. When people think of transforming furniture, the convertible click clack sofa beds are typically the first thing that comes to mind. It will work for people living in a studio or an apartment, where space prevents both a bed and a couch. If you have never considered a camelback sofa because you thought it to formal, think again. The camelback sofa is a great choice for fans of traditional styling. Aptly named for its curved back, the sofa comes in a variety of designs. Fashion come and go, yet, the camelback sofa never goes out of style. Without a doubt, a camel back sofa will become a centerpiece in your home. Chesterfield sofas add an air of sophistication to any space. They’re characterized by their button-tufted upholstery, their curved or rolled arms, and are equal in height to the back of the sofa. These pieces are great for adding comfortable seating and imparting an elegant look. We found best chesterfield sofas for small or big budgets, so you can bring one to your home right now. We dig up and curate about the best home furnishings - you decide if it’s worth the money. across the Internet landscape. You can use our knowledge to stay updated with the latest product releases, hottest furniture reviews, and much more to come! © Created with by ChosenFurniture - All Rights Reserved.